Barbara Marks is a multidisciplinary artist based in Connecticut. She uses color to create space. A child of the sixties, I fell into graphic design and established my own studio specializing in book design. In 2001, I left that behind to study painting at Lyme Academy College of Fine Arts (BFA 2005), and Brooklyn College CUNY (MFA 2008). I’ve been awarded artist residencies in Italy, France, and across the United States and have shown my work throughout the Northeast. Barbara Marks has been a resident artist at Vermont Studio Center, Virginia Center for the Creative Arts, Fowler Dune Shack (Cape Cod), MIRA (Martignano, Italy), Brush Creek Foundation for the Arts (WY), Jentel Foundation (WY), L.A. Summer Residency at Otis College of Art and Design (CA), The Hambidge Center for Creative Arts and Sciences (GA), The Research Studio at Art & History Museums-Maitland (FL), Monson Arts (ME), and Moulin à Nef (Auvillar, France). She has twice been a visiting artist at the American Academy in Rome. Barbara’s work has been shown at the Cape Cod Museum of Art (MA); Providence Art Club (RI); Painting Center, First Street Gallery, and Atlantic Gallery (NYC); Ground Floor Gallery (Brooklyn), Drawing Rooms (NJ); New Britain Museum of American Art; DaSilva Gallery, Silvermine Arts Center, Ely Center of Contemporary Art, Whitney Center, Serendipity Gallery, The Loft Gallery, Five Points Gallery, and The Chase Family Gallery (CT); McLanahan Gallery at Penn State Altoona (PA); The Affordable Art Fair (NYC); and Artist-Run at Satellite (Miami). Barbara is an artist member of The Painting Center (NY); Artists Collective of Westport (CT); and a Guild Artist at Silvermine Arts Center, (CT). Her work on paper is represented in the flatfile at Artspace New Haven. 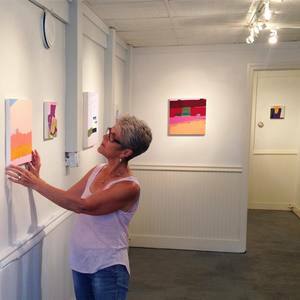 She is a Trustee of the Vermont Studio Center and a former board member of Artspace New Haven. Barbara divides her time between Connecticut and NYC.